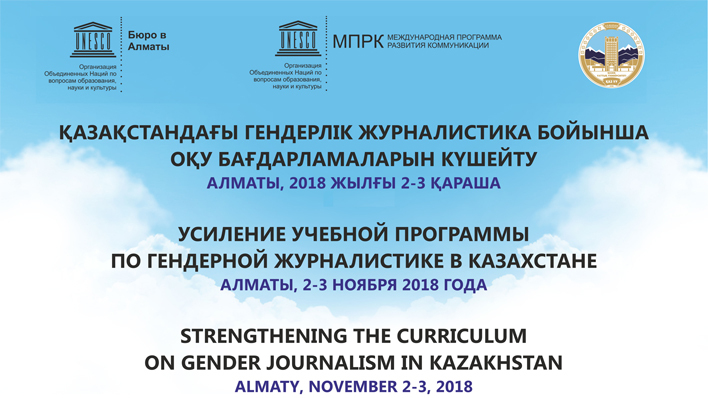 UNESCO’s International Programme for the Development of Communication (IPDC) supports the project Strengthening Curriculum on Gender Journalism in Kazakhstan. It aims to support journalism teachers from universities across the country to obtain knowledge and skills on teaching gender journalism. the training will be organized by UNESCO Chair on Journalism and Communication from 2 to 3 November 2018 in Almaty. Gender inequalities, stereotypes and discrimination in the media content are caused by the existing media policies and practices, as well as by the lack of training of journalism training. Gender as a subject area has a very limited focus at journalism faculties in Kazakhstan often displaying gender as a women’s issue This causes dissemination of gender stereotypes in the media content and advertisements, in articles, broadcasted TV and radio programmes. The IPDC-supported project will bring together 15 universities in Kazakhstan to develop a university curriculum based on the new UNESCO Journalism Education Model Curriculum. The training will take place from 02-03 November 2018 in Almaty. The project will contribute to Sustainable Development Goal 5: Gender equality and Goal 16: Peace, justice and strong institutions by using UNESCO's Gender-sensitive indicators for media: framework of indicators to gauge gender sensitivity in media operations and content (GSIM). The indicators helping to recognize fair portrayal of women and men through elimination of stereotypes; coverage of gender equality and equity; fair portrayal of women and men in commercial messages. About 62nd IPDC Bureau Meeting in Ghana.